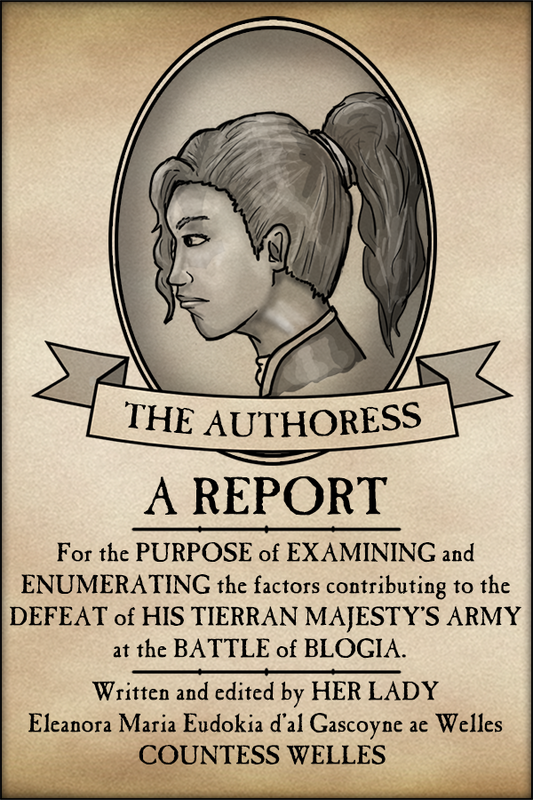 Let it not be forgotten by the reader that the main purpose of this report is not to offer an observation of the Battle of Blogia, but to use that analysis to examine the shortcomings and lapses which lead to the defeat of His Tierran Majesty’s forces on that day. To that end, it must follow that having offered this analysis, one must then go forth to offer potential solutions to the weaknesses enumerated. “Suffering builds character,” as the old Takaran saying goes, but it cannot do so unless those who have suffered are able to identify the reason which they have suffered, and the way to avoid such suffering in future. The bulk of this report has served to address the former. The section that follows now shall address the latter. As one has already mentioned, the shortcomings of the army that had been brought to Blogia under the Duke of Wulfram’s command were systemic. They were not the fault of the Duke of Wulfram, nor the fault of any officer under his command. Instead, it was the configuration of the army as a whole which was unfit for the task for seeking out and achieving victory. That is not to cast aspersions on the common soldiery or the equipment of the King’s Army, but it is to say that the changes which must be made are not to be discussed in terms of the relief or promotion of individual officers, nor is it to be framed as a change in the fundamental strategy of the Antari campaign. While some members of the Cortes are insistent that the reach of His Tierran Majesty exceeds his grasp in seeking a singularly victorious conclusion to the current conflict, one might more belief more substantially that such a victory might be achievable, should the following measures be taken. While many facts regarding the course of the Battle of Blogia are in dispute, one which most certainly is not is that the Duke of Wulfram ought not to have been taken by surprise by Prince Khorobirit’s Church Hussars. While some have claimed that Wulfram could have attempted to scout with his line infantry or his own heavy cavalry, such ignorant counter-factuals have already been proven without merit. One could more reasonably argue that had Wulfram possessed forces suitable for the purpose of scouting his right flank, he would have done so, discovered his opponent’s deception, and taken measures in advance. It is the establishment of such a force which I now suggest. What I propose is a small, specialised force of skirmishers and scouting troops. Perhaps one might be reminded of the brigand groups, the so-called “roadsmen”, of the late Petty Kingdoms Period, or even of the partisans which yet plague our forces in Antar. However, unlike such criminals and malcontents, this proposed force would be made up of regular soldiers of the King’s Army, as commanded by an infantry officer with experience and temperament suitable for the task. They would remain under military discipline, and serve at the pleasure of His Tierran Majesty, like every other soldier currently serving in Antar. Where they would differ is in the way that they would carry out their duties. Instead of moving in close order, these men would advance in a loose, dispersed swarm, so as to cover more ground and be less impeded by difficult terrain. They would be deployed and commanded on the company level, for a battalion arrayed in such a manner would be too dispersed and unwieldy to effectively control by voice. Led by a veteran Captain or Major young enough to be vigorous in body and mind, these forces would reach out before the main body of the army, serving as its eyes and ears. They would be dressed in dull colours, with only the minimal markings necessary to distinguish themselves from the enemy. Should they ever find themselves in a position to engage an opposing force, they would do so not with the infantry musket, but rifled carbines similar to those in use by our Dragoons, striking from beyond the range of effective retaliatory fire as skirmisher, raider, or in cases of extremity, as rear-guard. The establishment of such a force would require great sacrifices and flexibility of mind among both the officers of Grenadier Square, and the men who must put such a plan into action. It will divert healthy fighting men from the line battalions, where they are much needed. It will place pressure on our arms workshops, who must be required to design and fashion specialised weapon and equipment so unlike what they have made before. It will require the men of honour who would command such a force to accustom themselves to a way of fighting which possesses little. Such officers would have to give up the chance for promotion within their own regiments to serve in a force which offers no such prospects, as well as the likely opprobrium of their fellows and of polite society. Yet had the Duke of Wulfram had even forty men from such a force with him at Blogia, it is likely that he would yet be alive today. The King’s Army entered this war with no experience in the organisation or manoeuvring of large bodies of fighting men. Indeed, before 602, there had not been any action involving anything larger than a single regiment for nearly three generations. As a result, the way in which the Duke of Wulfram’s army was ordered at Blogia was the result of an improvised system based on hard-won experience and shaped by the interpretation of previous actions against inexperienced, and often inept Antari generals. Unfortunately, what had proved sufficient to defeat armies led by lesser leaders proved wholly inadequate when faced with an host which possessed competent, vigorous leadership. The brigade, as currently defined, is too unwieldy to be commanded effectively by a single man. While it is certainly possible for a General-of-Brigade to command his own regiment, or direct the dispositions of seven or eight battalions, he is not capable of doing both simultaneously. This was made evident in multiple incidents throughout the battle, where individual battalion commanders committed to attacks or holding actions on their own initiative, as they had slipped out of control of overworked brigade commanders who did not have the presence of mind necessary to rein in the colonels of other regiments, or offer sufficient support in time. The fate of 2nd Battalion, Grenadiers was perhaps the most obvious failure of this system. Had Castermaine been able to offer Wolfswood and his gallant men reinforcements, then their attack might have proved far less wasteful. Instead, Castermaine was focused on saving the other battalions of his brigade, and the command his own 9th Foot besides. The Earl of Castermaine cannot be blamed for doing his duty, but the system which made his responsibilities too much for one man to bear should be rightfully done away with. Therefore, one might reasonably demand that the size of brigades in future be limited to a shape more manageable by a single man, and that said commander be allowed to direct the whole of his purpose to the command of this brigade. If a General-of-Brigade were required to delegate the command of his own regiment to his Lieutenant Colonels, and the size of the brigade itself was reduced to six battalions or less (squadrons of horse, being smaller in number and deployed as a mass, have less a need for such limitations). The result would be a more flexible army, more capable of responding quickly to changing situations in the field, with senior officers made more able to focus performing a single duty well, as opposed to performing multiple duties poorly. The problem of the brigade commander being forced to serve as a regimental commander is also duplicated at the highest level, for the Duke of Wulfram not only acted as commander in chief of the army, but also as commander of the Cavalry Brigade, and colonel of his own Wolf’s Head Cuirassiers. As a result, he was obliged (as a colonel) to ride at the head of his men, whilst ordering his brigade (as a General-of-Brigade), which in turn cut himself off from command of the remainder of the army. Had Wulfram been allowed to devote the whole of his purpose to the command of his regiment, then his death would not have left the higher echelons of the army in confusion. Had he been able to remove himself from direct command of a subordinate portion of the army, he would have been able to direct the whole of the army’s operations even after the destruction of the Cavalry Brigade. Instead, the loss of Wulfram meant the loss of a crucial officer on the regimental, brigade, and army levels; leaving any chance of salvaging the situation to die in the resultant chaos. Thus, one would recommend that the Commander in Chief be removed from the direct command of fighting men altogether. The Commander in Chief’s sole responsibility ought to be the high-level direction of the component parts of his army. For this purpose, he must be kept at a distance where he is capable of observing the entire battle, and away from the distraction of seeing to the dressing of companies of foot or the entrenchment of batteries of cannon. In addition, those who would aid the high commander in his duties – his chief of staff, his runners, his quartermaster-general – must also be distanced from their home regiments and commands. At Blogia, Wulfram’s staff was made up of men chosen for the task a few weeks beforehand at the start of the campaigning season. As a result, the units which those men would have normally commanded were forced to fight with unproven officers, whilst the men who were to do the work of organising the battle and conveying the messages of the chief general were inexperienced in their new duties. The resolution of this problem demands the creation of a permanent staff, not of men borrowed from their regiments for a season of activity, but ones trained especially for the purpose of aiding the Commander in Chief in his duties. These men would be given from their home units like youths being sent off to the University – never to return save perhaps one day as master of their old estate. These ‘permanent staff officers’ would be schooled for the task in a college specifically organised for the purpose. Much as university students learn their calculus, their history, and their theology, these men would be taught the finer academic points of logistics, military theory, and organisation. From there, they would be attached to the permanent establishment of the Lieutenant-General. In times of inaction, they would conduct expeditions to evaluate the ground for the next season’s campaign, arrange the accumulation of supply, and conduct exercises in the direction of the army. During the campaigning season, they would perform the role which the staff of the commander in chief already performs, though with their abilities augmented by specialised training and long experience. No single person might be cast as scapegoat for the loss at Blogia. No single decision made on the part of any of His Majesty’s officers could be considered to have been a fatal turning point: it was not their battle to lose. Instead, it could be said that the senior command of the King’s Army, from the Duke of Wulfram down to the commanders of individual battalions and squadrons, performed their duties to the utmost of their abilities, for which many paid with their lives. In this case, blame cannot be laid at the feet of the fighting officers, but at the feet of tool which they were forced to use, not the enlisted men under their command (who fought with similar bravery, and sacrificed no less than their officers), but the system which officers and men were organised, deployed, and directed. The failures at Blogia were systemic ones: the lack of a light infantry force allowed Prince Khorobirit to achieve tactical surprise. The concentration of command responsibilities at three separate levels in the person of the Duke of Wulfram led to a moment of chaos after his death. The lack of a regularised staff structure meant that at the crucial moment of the battle, no one part of the army knew exactly what the other was doing. Command fell to the responsibility of the Generals-of-Brigade, and had it not been for Castermaine and Tourbridge’s magnanimity in accepting the Duke of Havenport as the army’s interim commander, the resultant defeat could have turned into an unmitigated disaster. Even so, despite the swift and unified response of Wulfram’s subordinates, the brigade commanders themselves were required to split their attentions between the tasks of commanding their regiments, and directing oversized, unwieldy brigades, an imposition which caused yet more oversights, and yet more losses. The system with which an army is organised is not the body of a fighting force: that honour must be bestowed upon the individual fighting battalions, squadrons and batteries which comprise it. However, it is the system of organisation which serves as a (to use the Takaran term) “multiplier of force”, which turns a disparate collection of fighting men and weaponry into a cohesive and effective army. It was already well known prior to Blogia that our system was far superior to that of the Antari. The proof was in the fact that it had allowed His Majesty’s forces to defeat larger Antari hosts on the field time and time again. Unfortunately, the Antari had brought their own multipliers of force to Blogia, in the form of a vigorous, competent commander, and a preponderance of numbers greater than ever faced before. It had been falsely assumed that the existing system, which had proven sufficient to the task on previous occasions, would serve its purpose at Blogia as well. In this assumption, we were gravely mistaken. If we are to defeat such a force as Prince Khorobirit’s army in future, then we must once again rewrite the formula of comparative forces in our favour. To attempt to do so by seeking better leaders would be folly: given their prodigies at Blogia, we might say with confidence that there are few better to be had. Seeking to improve our numbers would be equally ridiculous: Tierra has not the population to support a larger body of fighting men, nor the wherewithal to keep them supplied across the expanse of the Calligian Sea. One might place one’s hopes on new weapons and implements of war, but such developments are rarely practical, and are even rarely genuine improvements on a method of warfare which has seen only incremental improvement over centuries. This leaves only one practicable option. It is no easy thing to change the composition of an army. If it is to be done, it shall be done at the cost of a vast expenditure of treasure, of effort, and of the honour of good, earnest men. Yet the cost of not doing so has become too great to simply defer. His Majesty’s Army must make the measures necessary to take on a more efficient and effective form. In peacetime, such an imposition would be a luxury, but in our current state of war, where a loss might mean the destruction of our rights as an independent kingdom, such matters carry with it the weight of necessity. If we do not improve the methods with which we make war, then our enemies will continue to master us on the field of battle. The resources we might devote to this conflict will continue to dwindle, and our situation will grow ever more desperate. Down the route of caution lies the slow, piecemeal destruction of our ability to make war, and the total destruction of our wealth, our kingdom, and our way of life. Only by taking bold action might the situation be recovered now. Reform, swift reform has ceased to be a matter to be considered, it is a path which we must embark upon. At this crucial juncture, we might only reform, or perish. There is no third way.